It is not reef-safe. It is a large star needing plenty of space. It should not be kept with aggressive fish that may attack it. Feeds on detritus, dead matter and coral. Large chunky starfish, looks soft in appearance but the body is actually quite stiff and rigid. 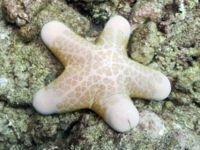 Pale pink base colour with clusters of small brown papillae in the central part of the body. This page was last edited on 8 August 2011, at 11:25.